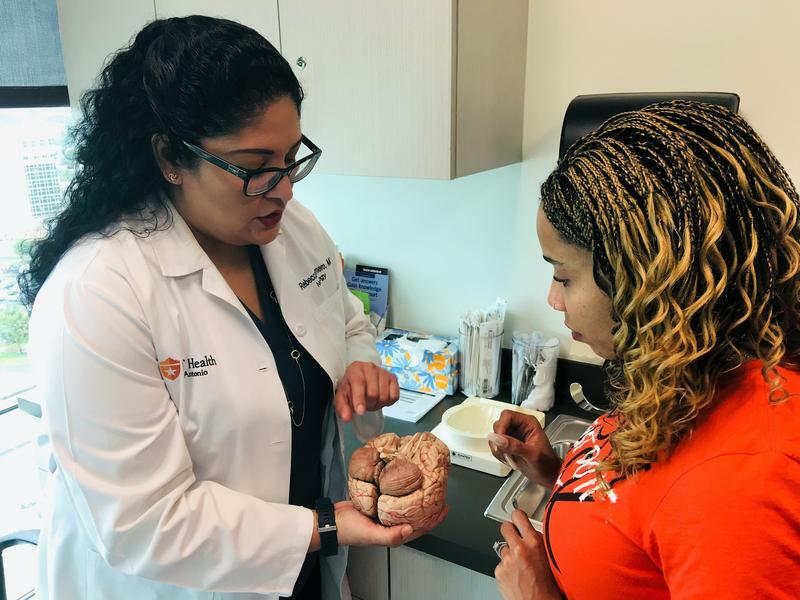 Dr. Rebecca Romero, director of the UT Health San Antonio Multiple Sclerosis Clinic, discusses the impact MS has on the brain with patient Antonia Santiago. San Antonio researchers have found a critical period of time during which some mobility might be restored to patients with multiple sclerosis. 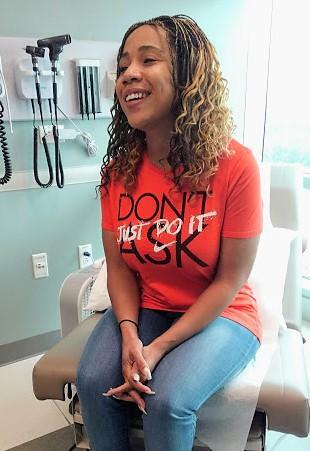 This discovery has doctors stressing the importance of early diagnosis for those with MS.
Antonia Santiago, 32, was diagnosed with multiple sclerosis when she was 20. She expected to be wheelchair bound by now, but she is not. Twelve years ago, Antonia Santiago, 32, had an unsettling experience. "I was 20 years old and I had gone to bed. Everything was normal and when I woke up, I couldn't feel the left side of my body but just from my waist down," Santiago said. It was weird and uncomfortable, she said, but not painful. So, she went to school. "I tried to continue with my day, but I just couldn't wake up,” Santiago said. “I was just kind of going through the motions of my normal day, my routine, but I wasn't awake — if that makes sense. And so I ended up leaving school and going back home and sleeping for another seven hours." Santiago knew something wrong — and she was correct. She was soon diagnosed with multiple sclerosis. Dr. Rebecca Romero, director of the multiple sclerosis clinic at UT Health San Antonio, said MS is a disease that has many non-specific symptoms, including numbness and fatigue. "There's loss of vision in one eye called optic neuritis; loss of strength in the legs or in the arms called myelitis. They can also present with excessive fatigue, difficulty walking — called ataxia — and typically these symptoms will last for at least 24 hours by strict definition," Romero said. Romero said because these symptoms could be caused by any number of things, MS often isn't diagnosed for a long time. Santiago was lucky. She lived in San Antonio and was diagnosed within weeks of the onset of symptoms, and new research finds that might be one of the keys to eventually reversing damage caused by MS.
Dr. Manzoor Bhat and Dr. Julia Saifetiarova have determined there is a window of time during which symptoms of multiple sclerosis can be reversed in mice. Dr. Manzoor Bhat, MS researcher and chair of the department of cellular and integrative physiology at UT Health San Antonio, has been working with mice, and he has found that there is a period of time during which some lost mobility related to MS can be restored. But beyond a certain point, it can’t. "Essentially, our work says that there's a critical time window in which we must have functional recovery so that you can get better outcomes. But if you wait too long, the neurons and their axons are too sick to recover and you're not going to recover that function ever," Bhat said. Some people may miss that window because the symptoms of MS are so subtle that many people, particularly those in rural areas, endure for years. Romero said misdiagnoses happen all the time. "Part of our mission as a comprehensive MS center is to spread that knowledge, whether it's within our medical students that rotate through our clinics ... and also we've given talks in other parts of Texas to speak about multiple sclerosis to family practice doctors,” Romero said. “Oftentimes they're the first people that will see these patients, so recognition is definitely key." Santiago has lived with the disease for more than a decade. When she was diagnosed, she expected to lose her ability to walk but she had not. Research like Bhat's tells her the longer she can keep moving, the more likely it is that she'll be able to get some lost function back. "It's good. It's very good. I know the disease will do what it does. It's doing what it does right now while we're speaking, but I'm ok. I'm functional, and I know how bad it can be,” Santiago said. Now that Bhat has determined there is a window in which damage caused by MS might be reversed, his lab is working to figure out exactly how to reverse it, so a therapy can be developed. "I love research like that. I am constantly picking my doctor's brain about what's new and what's upcoming. I'm just excited for all of it," Santiago said. Previous estimates said about a half million Americans have MS, but recent research said the number may be closer to a million. Bhat’s research was published in July in the Journal of Neuroscience.